Laundering Instructions: Machine wash cold, with like colors. Do not bleach. Tumble dry low. Do not iron. Do not dry clean. The Simpson Capri is designed to be a hiking pant, with articulated knees and adjustable cuffs. The middle of the articulation is 14.5" (36.8 cm) from the crotch seam, and 8" (20.3 cm) above the cuff. The capri uses a zipper and button to secure the garment. The waist does not have any elastic, but does have belt loops. The cuffs have a 21" (53 cm) opening, and can be adjusted using the shockcord and cord lock provided. All stitching on the outside of the capri matches the material, except for small bands of tan stitching on the top and bottom of the opening for the front pockets, and the right and left of the back pockets. The back right pocket has a "W" embroidered on it. The capri has two tags sewn into the inside back, one with the White Sierra logo, and one beneath it with the size and washing instructions. The inside of the waistband and the front pockets use a light blue fabric with a cloud design. On top of the cloud fabric on the waistband is a 0.25" (0.64 cm) white ribbon, with a dotted line of a silver colored foil/thread. The capri came with a hangtag with the size, style, color, suggested retail and bar code on it, and a hangtag that states "For more than 25 years, we've worked hard to make our cleanly designed apparel as active as the loyal customers we cater to. White Sierra apparel is easy to wear, durable and functional, all of which is underscored with a strong sense that clothing for the outdoors must also look great. All white Sierra apparel is guaranteed against defects in materials and workmanship." The tag also includes a phone number, "Sunnyvale, California", and their web address. There is an orange circular sticker on the capri that says "UPS30 sun protection". The capri has four pockets (five if the inner right back pocket is counted separately), right and left in both front and back. The opening for the front pockets are close to vertical, and is 7" (17.8 cm) wide. The pocket is secured to the capri at the top and the side. The pocket is wider at the bottom at the top, measuring 4" (10.2 cm) at the top, and 7" (17.8 cm) at its widest point (about 2"/5 cm from the bottom). The front pockets are 10" (25.4 cm) at the tallest point. The material that makes up the 'back' of the pocket is light blue with a cloud design, and the material for the 'in' side (between the back pocket wall and the material of the capri itself) is a white mesh weave. The back pockets are similar to the back pockets of most jeans. They have a double-line diagonal sewn into them, apparently for decoration. On the right pocket the line goes from top right to bottom left, and on the left pocket it goes from the top left to the bottom right. The regular left and right back pockets are sewn onto the outside of the capri, with a top opening of just under 5.25" (13.3 cm), by just over 5.5" (14 cm) tall. The pockets are rectangular with a chamfer on the bottom corners. The inside right pocket has a zipper closure, with an opening of just under 4.5" (11.4 cm). This pocket goes through to the 'in' side of the capri, with material matching the capri on the 'back' side of the pocket, and white mesh makes up the wall of the pocket that is between the back pocket wall and the capri itself. This inside pocket is 5.5" (14 cm) wide by 6.25" (15.9 cm) tall. These pants seem a little on the long side for a capri, though I have seen some other pants that extend well below the knee classified as capris also. Mid-way between the two front articulations on each leg is a seam that runs along the back of the leg. On me, this seam is about 3" (7.6 cm) below the back center of my knee. I usually take small/petite for most of my pants and jeans, so the fact that they are a little long on me (taking into account where the knee is supposed to ideally fall) is not surprising, although it is a little longer than I had expected. Aside from being a bit on the long side, the capri fits quite nicely. On me the waist sits a bit lower than most pants, though not annoyingly low. Although the capri is slightly loose, they're not to the point where I would need to wear a belt with them. I'm not overly limber, but in all the stretch positions I tried with the capri on I've had good movement, and so far have not found anything that would restrict my movement or provide an uncomfortable situation. The material feels just slightly rough. It is not so rough that it feels like it might cause a problem with comfort, more like a lack of smoothness. The blue cloud fabric that makes up the front pockets is smoother that the rest of the capri fabric. One thing that I found a little odd about the way White Sierra presents the capri is that there is no information attached to the capri itself to tell me that it is a quick-drying material (which is something I usually look for when selecting hiking clothes). Also, their website fails to mention the front pockets altogether. 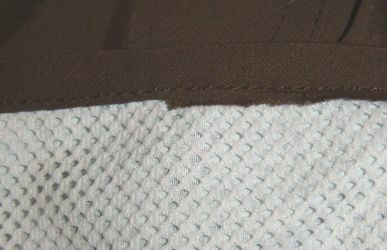 The website mentions "contrast color stitching", which is apparently limited to a thin 0.25" (0.64 cm) band of tan stitching at either side of the pocket openings. I am uncertain why the inside waistband needs the white ribbon, and especially why the ribbon has silver foil/thread details. Using the shockcord (which is light tan with white stripes) and cordlock (grey plastic) , I can set the cuffs to lie above my calf or above my knee, though when I set it above my knee it gets really baggy and feels weird when I walk. If I have the cuffs secured above the knee and stretch out the fabric so it hangs straight without bunching I end up with what looks like Bermuda shorts, hanging just below my knee when I stand and pulling up to mid-kneecap when I sit. I don't know if the 'shorts' option is why they are designed this way, though it could come in handy if I'm wading in a stream and don't want to get the capri wet. I was pleasantly surprised to see that the capri had more pockets than mentioned on the website, since I was only expecting the back pockets. 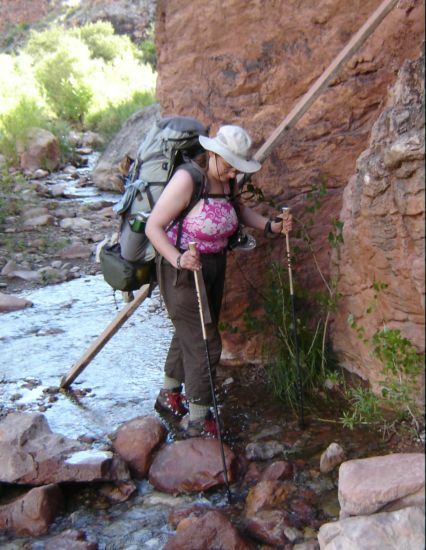 I am used to hiking pants and shorts with cargo pockets, so while I might have to adjust a little to the lack of those, I think I should be able to do fine with what is provided. For the most part, the stitching and general construction looks good. The only error I found in construction was a 4" (10 cm) section of seam on the front left pocket. This section was not tucked under itself like the rest of the seam, providing a potential area for the material to wear. Since this seam is where the mesh side of the pocket faces the capri itself, I do not know if this would pose a problem or not. Over the next four months I plan to take the Simpson Capri with me a 4-night rim-to-rim backpack of the Grand Canyon, and also in the more moderate climate of Michigan. During this time they will be my primary hiking pants and will be exposed to dust/dirt, wading in creeks, branches (probably including some thorny wild raspberry types), and log-straddling. 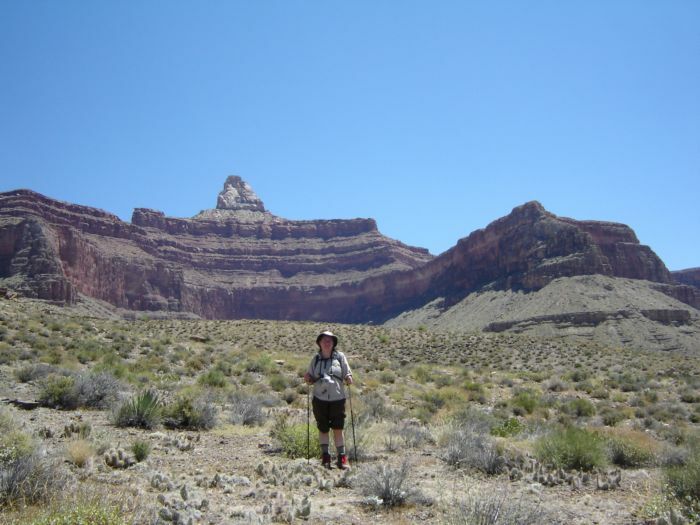 To date, I have worn the Simpson Capri on a 4-night rim-to-rim hike of the Grand Canyon in early June, during 2 days of dayhiking in Grand Canyon National Park prior to the rim-to-rim, and on several local walks and around the house. On my rim-to-rim hike, I travelled 6.9 miles(11.1 km) with an elevation loss of 4200 feet (1280 m) the 1st day, and 7.6 miles (12.2 km) with an elevation loss of 1550 feet (472 m) the 2nd day. The 3rd day I dayhiked part of the Clear Creek Trail in the morning, over 6 miles (9.7 km) round trip with an elevation gain and loss of 1520 feet (463 m). The evening of the 3rd day I dayhiked up Phantom Creek a little, about 5 miles (8 m) round trip with an elevation gain/loss of about 300 feet (91 m). The 4th day I backpacked 4.7 miles (7.6 km) with an elevation gain of 1350 feet (411 m), and a final hike out of 4.6 miles (7.4 km) with 3040 feet (927 m) of elevation gain on day 5. The low waistline of the Capri took a little getting used to, but after a while I became comfortable with the fit. At one time I had tried using webbing with a buckle (the kind I use to strap big gear to the outside of my pack) as a belt. I quickly found that wearing a belt wasn't very feasible, since (at lease on me) the front curves down, and with the locations of the belt loops, I ended up with the belt sitting on my bare skin above the Capri. I think that the Capri could benefit from a little re-design, either adjusting the style of waistline, the location of belt loops, or adding a section or 2 of elastic for a better fit. When I was wearing the Capri around the house with the bottoms cinched, I caught the loop of shock cord a couple times on the legs of folded TV tables when I was cleaning around the TV table storage rack. I have not had a problem with the cinched bottoms catching anything out in the field yet, although for most of my Grand Canyon trip I had them loose to help with ventilation. After the end of this test I will probably end up cutting the shock cord and knotting the ends to help prevent them from catching on things. Also, about a week before I went on my backpacking trip I noticed that one of the grommets for the shock cord had dislodged from the fabric. The material around the hole was not frayed, and to date I have noticed only a little fraying at this area. On my rim-to-rim hike, I basically wore the Capri for 5 days straight. At the end of the trek I didn't notice any staining from sweat/canyon dust (which can turn white socks orange-pink for life it seems) and if they held any odor I didn't notice at the end of the trip or when I was packing them up in my suitcase after a well-deserved shower. The dark brown color absorbed some of the heat from the sun (I had temps in the mid to high 90's F - 35-37 C - for most of my hike), though I did not feel like I was overheating at any time. The capri was pretty efficient at wicking, and I never noticed any sweat buildup on my legs. It dried about as quickly as most of my wicking clothes, and when the pants were soaked from me intentionally dousing them in water, the wicking provided a nice cooling effect in the heat. Although on me the Simpson Capri is more like a short pant than an actual capri, the length of the garment did come in handy on my hike. In the afternoon of the first day I tripped and took a dive onto the trail. The trail was sand/small rough gravel with some medium rocks tossed in for good measure. I landed mostly on my left knee and arm. While my arm had a pretty good scrape about 1" (2.5 cm) in diameter, my knee (which took the majority of the force) was protected by the Capri and only received a good bruising. Typically, I would be wearing shorts (or convertible pants in shorts mode) in this environment and I would probably have gotten a nasty scrape and later scabbing on my knee if I had not been wearing the Capri (this actually happened to me last year, with the same knee). After I resumed hiking, my knee would rub against the Capri (since the articulation for the knee falls well below my knee), making it painful when I had to step over something. I eventually threw fashion to the wind, and hiked up the pant legs over themselves to make them into 'shorts'. I continued to wear them hiked up a good deal of the trip. They were fairly comfortable in this way, I managed to adjust the shock cord to where the legs would stay where I wanted them, but it wasn't affecting my circulation. I just wish that the Capri was available in petite lengths, so that the articulation would fall where it should at my knees, and the garment as a whole would come up higher on my legs for a bit better ventilation. I think that if the articulation fell correctly, I would probably keep them at capri length since they offer a nice balance between knee protection and leg ventilation. Overall, the capri has held up well to my use and abuse, and I didn't find any fraying on the spot where I did a nose-dive and landed on my knee. I like the concept of the Simpson Capri, though there are a few modifications I would like to see that would make these really work well for me in the backcountry. Since the Field Report, I have worn the Simpson capri on a couple day hikes and around the house. About two weeks ago (at 16 weeks of pregnancy) I discovered that my tummy had grown too large for comfort in the pants. Before then, they remained pretty comfortable. The capris have worn well, and are still in good condition, with the hole where the grommet popped out remaining intact. Overall, they work very nicely for hiking and backpacking, though they will probably not come with me on future backpacking trips. The main reasons are that they are too long for my shorter legs, so the articulated knees fall well below where I need them to be, and the capris are just a little shorter than my regular convertible hiking pants. If these were available in shorter lengths that fit me better I would seriously consider a pair, since a capri would offer me more ventilation for my legs while helping to protect my knees since I'm such a klutz. What I liked: Wide leg holes, so that I can hike the capri up to shorts length easily, the adjustable leg cuffs, and the idea of a capri-length hiking bottom. What could be improved: availability in different lengths so that I could get a petite and have the articulated knee fall properly and actually have a capri-length pant, and some modification to the waist to make it easier to use a belt or to make the use of a belt unnecessary. This concludes my report series. I would like to thanks White Sierra and Backpackgeartest.org for the chance to test the Simpson Capri.